She has nine lives. Each one devoted to crime! From the shadows of Gotham City emerges one of Batman's most deceptive foes, Catwoman. A cunning jewel thief with an agenda of her own, Catwoman holds a mysterious allure for the Caped Crusader, an allure that can be deadly! Pick up the trail with 3 exciting episodes starting with The Cat and the Claw, Part One. Batman foils Catwoman trying to steal a valuable necklace she intends to sell to buy a mountain lion preserve, but it seems a certain underworld group, led by the mysterious Red Claw, has its sights set on the same piece of land. With Batman and Catwoman forced to work together in The Cat and the Claw, Part Two, the unlikely duo has their hands full in a showdown with Red Claw. 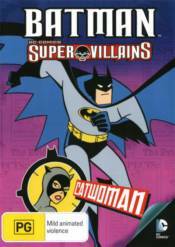 Finally, witness Batgirl Returns, as Barara Gordon once again dons the mask of Batgirl to investigate the theft of a prized jade statue only to find Catwoman already on the case. Together, with a secret ally in tow, they unravel a mystery with far greater implications. So, crack the whip and steal away to Gotham City for some adventure with Batman and Catwoman!